Model B was a new Ford automobile produced in model year 1932. It was a much updated version of the Model A and was replaced by the 1935 Ford Model 48. Strictly speaking the Model B was a four-cylinder car with a Ford Model A engine, but it was at this time that Ford began producing a very similar car with Ford's new Flathead V8 engine. The V8 car was marketed as a Model 18, though it is commonly called the Ford V-8 today, and was virtually indistinguishable from the Model B. Until this time, Ford had always produced only one basic car at a time. 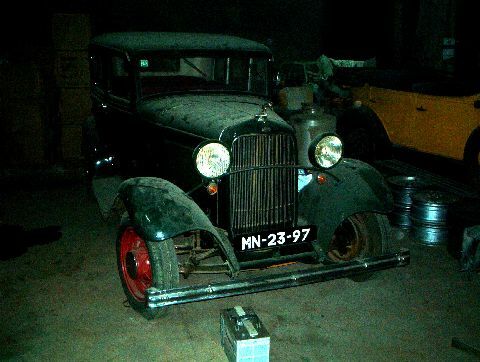 There were two versions of the ’32 Ford – a four-cylinder and the V8 flathead. They came in a variety of body styles, the 2 door roadster, 2 door cabriolet, 4 door phaeton, two and four door sedans, four door 'Woodie" station wagon, two door Victoria, two door Convertible Sedan, Panel and Sedan Deliveries, 5-window coupe (two door windows, two quarter panel windows and the rear window), and the 3-window Deluxe Coupe that featured front opening doors, also known as Suicide Doors. The Deuce was called Model 18, the “1” standing for “first” and the “8” for V-8. The four-cylinder model was the less popular Model B, a refined version of the four-cylinder Model A, the most significant difference being a boss for a fuel pump, since the gas tank had been relocated from the cowl to the rear of the car and could no longer rely upon gravity feed. The ’32 Model 18 was the first successful V-8 in a low-priced car. Prices ranged from $460 for the roadster and the coupe's $490 to the $650 convertible sedan. Production totals numbered from 12,597 for the roadster to 124,101 for the two-door sedan. Nowadays, the roadster and coupe are notable, as these body styles are more used in making the models into streetrods. Today, the 1932 Model B is a highly collectible car that people will pay thousands of dollars to restore to exact original style. During the WWII period, when they were first getting old, the Model Bs and V8s were frequently altered into hot rods. This continued into the 1960s on a large scale. Since the 1970s, 1932 bodies and frames have been reproduced either in fiberglass or lately in steel, which has helped resolve bodywork shortages, and increased the number of "rods" being created or restored. Those that are made, are often very expensive. A typical auto-show hot rod is a $60,000 proposition or much more, in a few cases. Deuce coupe is a slang term used to refer to the 1932 Ford coupe, derived from the year of manufacture. In the 1940s, the '32 Ford became an ideal hot rod. Hot rodders would strip weight off this readily available car and soup-up the engine. They came in two body styles, the more common "5-window" (two door windows, two quarter panel windows, and the rear window), and the rarer "3-window" Deluxe Coupe that featured suicide doors. Since the inception of Hot Rodding, the Deuce (1932 Ford) has been at the top of the list of cars made into these radical machines. The 1933 revision of the car was substantial, especially considering how important the 1932 change had been. For its second year, the Ford's wheelbase was stretched from 106 in (2692 mm) to 112 in (2845 mm) on a new crossmember frame. The grille was revised, gaining a pointed forward slope at the bottom which resembled either a shovel or the 1932 Packard. Both the grille and hood louvers curved down and forward. Power from the V8 was also increased to 75 hp (56 kW) with a revised ignition system. The four-cylinder engine continued unchanged, but referred to as the Model C. Total sales for the model year were up to 311,113. 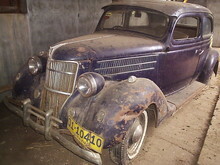 The 1934 Ford (called the Model 40A) was not as substantial a model year change as the previous two years had been. Noticeable changes included a flatter grille with a wider surround and straight hood louvers. V8 output was again upped, this time to 85 hp (63 kW), and the four-cylinder Model A engine was in its last year as was the Victoria body style. Most newly built hot rods use fiberglass or more expensive, newly minted, steel bodies. The classic 1932 Ford lines are closely reproduced with new bodies. Sometimes original bodies are used, However the cost of originals is quite high. 1933 Fords are also popular starting points for hot rod construction.